Earlier in the week we saw a trio of top Intel Core 9th gen series processors unveiled via a since removed Chinese tech news site bulletin. The leaked details included outline specifications of the Intel Core i9-9900K, Core i7-9700K, and Core i5-9600K. Now a new rumour, via German site Golem.de, suggests that the top two processors we discussed on Tuesday will feature Intel's welcome return to using soldered integrated heat spreaders (IHS). In its report, Golem says that it is only a few more weeks until the release of the Core i9-9900K and thus more and more details are emerging through partners, distributors and so on. It has talked to several such "Intel-related" sources, which have "independently confirmed that Intel connects the metal lids to the processor via solder." Translation and phrasing is taken directly from Google Translate. 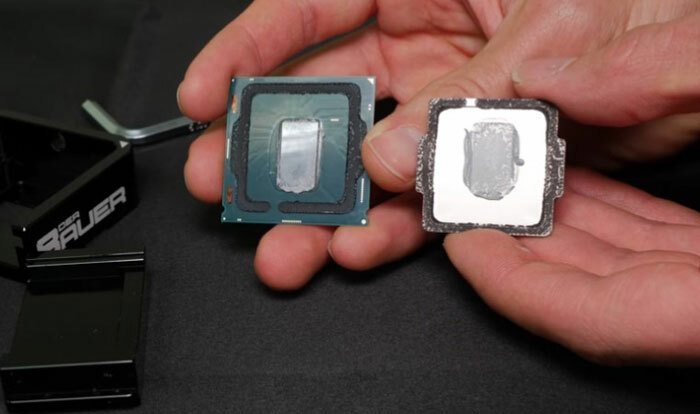 The move to metal solder is exclusively to the octa-core processors, says Golem. Those processors with six cores or fewer will simply use classic thermal compound under the IHS. Intel has chosen to move to a soldered IHS for at least one reason - it can deliver a 15 to 20 degrees Celcius benefit, meaning these processors can run at higher base and boost clocks. Remember, the rumours point to the top-end Core i9-9900K that can run at 5.0GHz boost on up to two cores, only reducing to 4.6GHz on all eight physical cores. As well as the cooling performance benefits, Intel's top octa-core CPUs will benefit from not looking compromised in comparison with AMD's similarly targeted processors. As a flagship consumer, or 'halo', product range Intel doesn't want any unflattering comparisons quality wise as it seeks the best prices for its products. Intel's Core i9-9900K, Core i7-9700K, and Core i5-9600K are expected to be released in September and are said to run in motherboards with socket LGA 1151 v2. If true it's probably out of necessity - 8 Skylake cores at close to 5GHz means a lot of heat to shift and would probably throttle quite significantly. It would be quite funny to see if the 8 core can get away with a basic air cooler when the 6 core struggles regardless of cooler used! Isn't the bigger story no more hyper threading on i7s? Assuming it's true, it's just a way of differentiating between the different tiers. TBF,it would not surprise me if the 8C/8T CPU runs games better than a 6C/12T CPU,since games tend to scale better with cores than virtual threads. It also means people who were defending Intel not using TIM for XYZ reasons,ie,its for the environment,it will damage the chip,etc can see the real reason - cost.